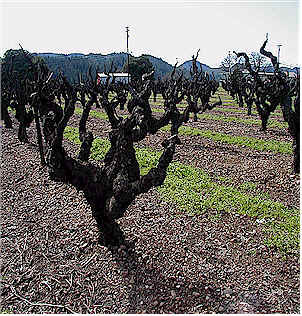 Doug Nalle started his own Zinfandel winery back in the 1980s, having been making wine in Sonoma for a brand called Balverne and, later, Quivira. He and his wife Lee have a small "underground" (ha!) cellar located behind a small patch of old vines on Dry Creek Road in Healdsburg. 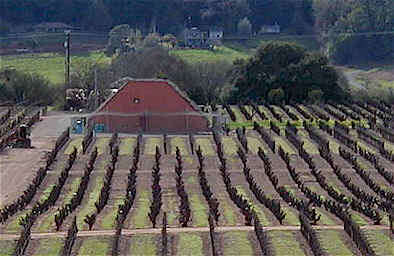 The cellar is, technically, above ground as you can see in this photo (taken from their residence). But upon closer inspection, you'll see there's vegetation covering the building! Doug has several inches of soil over the top of the building and it's covered with rosemary bushes! His wife's family owns some vineyard property, her grand-pappy having planted the vin in this photo back in 1927. Doug gets Zin from several neighboring vineyards, all the fruit being from Dry Creek Valley. Since the old-timers planted several varieties within a vineyard, Doug can't say precisely what's in his Zinfandel. He guesstimates it's about 88-92% Zinfandel, with the rest being small amounts of Alicante Bouschet, Petite Sirah and perhaps even a drop or two of some white varieties such as Berger or Palomino! Doug's recipe is simple: There are six open-top fermentation tanks in which he ferments the juice. The winery has a bunch of barrels stacked up on metal barrel racks. 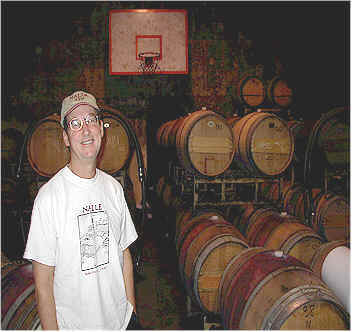 As you can see, like most California wineries, there's a backboard and basketball hoop in the cellar. 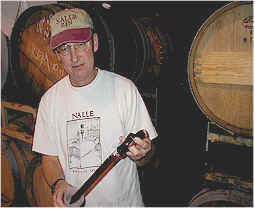 The wine goes into 60 gallon French oak cooperage, 20% of the barrels being new each year. Doug says he's shortened the time of barrel-aging from 14-18 months, preferring (now) to bottle the wine after about eleven months in wood. 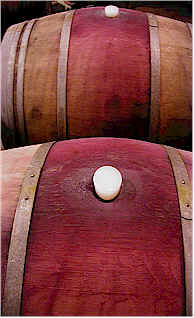 "Better to bottle the wine a bit early while it has its fruit, than to lose the fruit by leaving it too long in wood." he explains. Though known for Zinfandel, Doug can't resist the temptation to make Riesling and Pinot Noir (the sign of either a true wine lover or he has masochistic tendencies and needs professional counseling). I tasted a pretty fair Riesling (bone dry, of course) and a dynamite Russian River Pinot Noir while we poked around the cellar. There are even a few drops of Syrah! 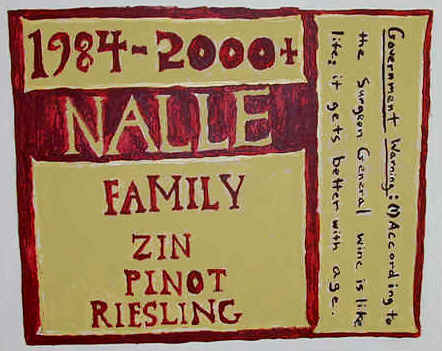 I was honored to be invited for Doug's 2001 "Vertical Tasting" of Nalle Zinfandels. "An above average vintage which pushed alcohol levels towards 14%, but it doesn't have the tannic structure of 1999..." Beautifully bright ruby red color with excellent fruity, raspberryish aromas. It almost doesn't taste dry, perhaps due to the relatively low level of tannin and the exceptional fruit on the palate. "...best vintage since 1994...no faults or flaws...I like the spicy finish. It's unusually spicy..." Very bright ruby red color...lots of berryish notes and sweet oak...cedary notes with some vanillin...very intense, mouthfilling fruit...fresh...nice tannins...very fine. "...tough year, with some of the same problems we encountered in 1989...astringent and not a whole lot of depth..." Youthful robe...sweet cherry notes with a hint of raspberry and a faint herbal note. Very light on the oak...dry, medium-bodied and lightly tannic. "A year with a serious amount of botrytis...highly acclaimed by some of The Critics...many wines have high levels of volatile acidity, making them attractive to many at an early stage, but not a vintage to keep more than a couple of years..." We had this in one of our blind-tastings and it didn't fare well, so I was curious to re-visit the 1997. I found mildly herbal notes and a cocoa note. Softer styled and a bit shy of fruit, though it seems to have a tannic 'grip' which gives this wine a sense of strength...Graceful. "Reminiscent of the 1975 vintage in that it was overshadowed by the bigger, more flashy wines which preceded and followed...Much like the 1992 and 1988 vintages...this wine is 'tight' and I don't know what it's gonna do. It's in purgatory right now." Clear...medium ruby color...bright fruit, brambly and very much "Dry Creek" in fragrances, with a hint of a dusty note. Very nice on the palate, it's both nicely developed and yet seems to have a bright future. 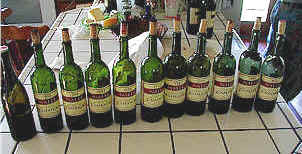 "..The highest alcohol, with a hint of sweet volatile acidity...it shows a green, stemmy note. It lacks 'middle' and is best to drink now..." I was more positive about this wine than was winemaker Doug Nalle. I thought it displayed some vanillin and creamy notes with clove and nutmeg spices. Medium bodied, it still has a touch of tannin which suggest a few more years of cellaring are possible. "...this is a surprising vintage. I keep waiting for it to go belly up....1993 was a less-than-stellar vintage and yet this wine is surprisingly good...." Medium ruby color, this displays mild fruit with some berryish notes and a touch of an herbal tone. The overall impression is a touch sweet with respect to the fruit. Quite a nice mouth-full of wine and it still has some tannins to resolve. "...I'm surprised it's held up. I didn't think much of this at the outset. The vintage produced really small berries...it's a decent glass of wine, if a bit thin, like an okay Chianti..." I found some vanillin notes in this wine with the Nalle "clove & nutmeg" spice elements. It's got a dried fruit element, hinting at raisins or prunes, but only a hint. "...This has always been a favorite. It's weird but weird in a great way...I like the start, middle and finish....It has some Brettanomyces and it did have CO2 at one point, so there was something going on in the bottle a few years ago..." Nice fruit with hints of berries and cocoa...mildly leathery notes with the point of development which indicates it's gone as far as it will go. It still has a bit of tannin...I was reminded of the rose petal notes one finds in aged Barolo. "...It's fading and at the end of the line. Why wait to drink this? I'm happy it's lasted as long as it has..."
Doug also noted that a number of earlier vintages are still alive and kicking. With a somewhat brickish-colored, aged robe, this is mildly brambly with a sweet bouquet...refined and elegant, it's still a shade tannic, but fully developed. Nice.